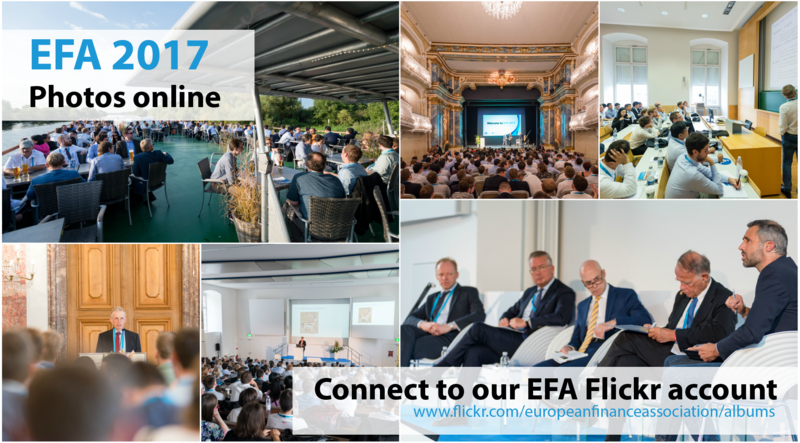 The University of Mannheim, Business School is proud to host the 44th Annual Meeting of the European Finance Association. The meeting will take place from August 23-26 at the Mannheim Palace, the main campus of the University of Mannheim and one of the largest baroque palaces in Europe. On Wednesday, August 23, a Doctoral Tutorial will be held. In addition, there will be several social events, which will provide excellent opportunities to meet colleagues and to exchange ideas. The EFA 2017 team wants to thank you for attending the 44th EFA Annual Meeting hosted by the University of Mannheim (August 23-26, 2017). Organizing such a conference is always a team effort and would not have been possible without the support from all involved parties, including track chairs, reviewers, session chairs, authors, presenters, discussants, partners, exhibitors, and all other participants. We hope you enjoyed both the scientific and social programs. Our primary goal was to provide an excellent academic program and opportunities to network with old and new colleagues. We hope that you enjoyed the EFA 2017 and we look forward to seeing you again next year in Warsaw (August 22-25, 2018). The program is online on the online platform at www.conftool.com/efa2017 until January 2018. The pdf. of the program can be downloaded by clicking here. The pictures for the EFA 2017 are online. You can check them on the EFA Flickr account.